This is an oval Thomas Ryan’s Lager porcelain sign. This particular Thomas Ryan’s Lager sign is white with blue and red print. 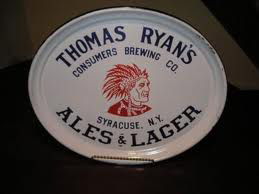 It reads, “Thomas Ryan’s Ales & Lager, Consumers Brewing Co., Syracuse, N.Y.” and features a red Indian chief in the center of the sign.